You are here: Home / Articles / Day 3: Unbelievable! Day 3 on my Pacific Northwest vacation and today we decided to head to Washington State and the city of Centralia located approx. 85 miles from Portland, Oregon and around 85 miles from Seattle, WA. 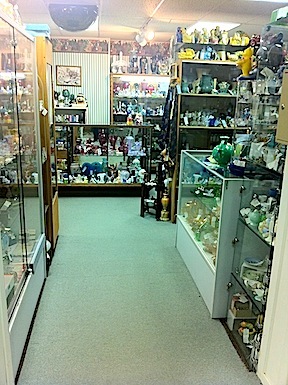 We read about a really big antique mall “Centralia Square Mall” with over 135+ dealer booths, 2 floors, and a downtown with several antique shops so we figured if we didn’t find anything at the big mall we could surely find some things at the other shops. We headed out around 9:30am and had a pretty nice drive to Centralia with lots of snowy countryside to see along the way and a few coffee stops. 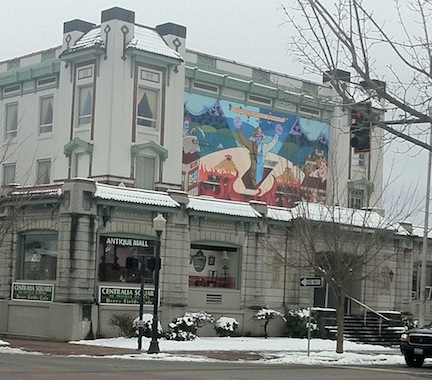 Driving into Centralia you see a quaint little town with lots of cottages and bungalows from the 1920s-1940s. We drove and drove and not matter what, we could not find Centralia Square Mall. We parked in downtown Centralia and started walking up and down the street as there were several antique shops and according to the address for Centralia Square Mall it should have been right in front of us. We could not find this mall…..it was getting pretty cold and snow starting to fall so a brilliant idea came to me to call the mall and ask for directions (my iPad and Google Maps was not helpful) the lady that answered the phone at the Centralia Square Mall was no help….she could not believe we were not able to find them and could not even provide some landmarks to help us get to the mall!! We got back in the car and drove around again for another 45 min and were getting so darn frustrated that we happened to take a wrong turn and guess what – we found the Centralia Square Mall! Yep, this Centralia Square Mall looked pretty darn huge from the outside so we were so excited to have found the place and because of its size thought we would for sure hit the jackpot with treasure in this little town. 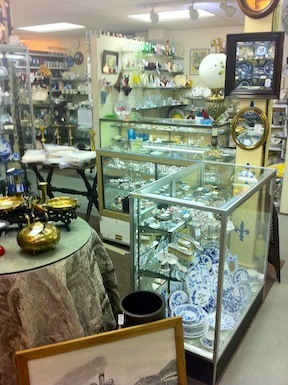 First impressions are that Centralia Square Mall’s majority of dealer booths have glass…tons and tons of glass. Yes, the glass is beautiful but I am not particularly interested in glass and almost all I could see on the first floor was glass. Also, everything was super expensive!! Yikes! I found a darling pair of vintage kitty cat salt and pepper shakers but quickly put them back as they were marked at $9.50 each…and they didn’t even have stoppers. 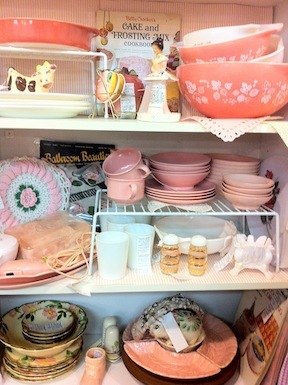 Also, any little plate or tea cup was over $35! Today was the first time we experienced a strange feeling of being watched. No one working at the mall talked to us or greeted us when we walked inside but some ladies were “following” us around and “keeping an eye on us” and not in the way of wanting to provide customer service either. Anyway, we saw there was a 2nd floor and headed up. The 2nd floor at Centralia Square Mall was also very expensive and had an abundance of animal figurines and books. Figurines I have seen at other antique malls that were under $25 were $79 at Centralia Square Mall. We were not having any luck at the mall. We were soooooo disappointed and totally depressed. 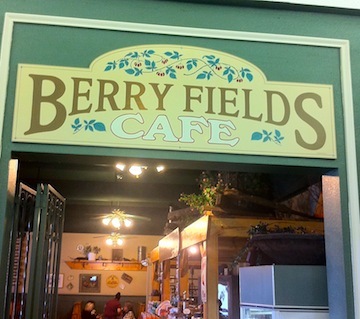 Berry Fields Café at Centralia Square Mall was the highlight! Centralia Square Mall has a lovely coffee shop/restaurant that was actually packed with patrons. We grabbed an empty booth and looked over the menu and placed our orders, the food was yummy and service great. WOW- the restaurant in the mall was a better experience than the mall!